Babylonian amora of the third generation; a pupil of R. Ḥisda, and a fellow student of Raba, who was somewhat his junior (B. B. 12b; Suk. 29a; comp. Rabbinowitz, "Variæ Lectiones"). He frequently addressed questions to R. Ḥisda (Ket. 86b; Yoma 58a; Pes. 27b; 'Er. 8b, 73a). R. Ḥisda once asked him a question to which Rami found an answer in a mishnah; R. Ḥisda thereupon rewarded him by rendering him a personal service (B. Ḳ. 20a, b). He was also associated with R. Naḥman, whom he often endeavored to refute ('Er. 34b; B. M. 65a; Ḥul. 35a). Rami married the daughter of his teacher Ḥisda; when he died, at an early age, his colleague Raba married his widow. Raba declared that his premature death was a punishment for having affronted Manasseh b. Taḥlifa, a student of the Law, by treating him as an ignoramus (Ber. 47b). Rami b. Ḥama was possessed of rare mental acuteness, but Raba asserted that his unusual acumen led him to reach his conclusions too hastily. He attempted to decide questions independently, and would not always search for a mishnah or baraita to support an opinion. 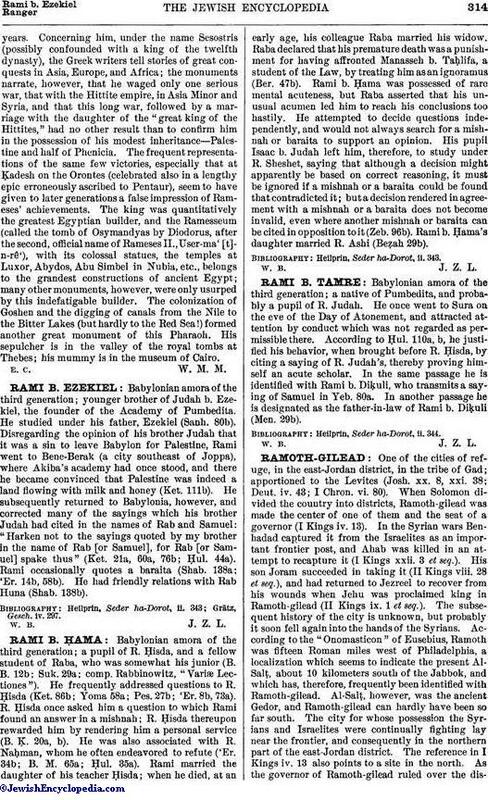 His pupil Isaac b. Judah left him, therefore, to study under R. Sheshet, saying that although a decision might apparently be based on correct reasoning, it must be ignored if a mishnah or a baraita could be found that contradicted it; but a decision rendered in agreement with a mishnah or a baraita does not become invalid, even where another mishnah or baraita can be cited in opposition to it (Zeb. 96b). Rami b. Ḥama's daughter married R. Ashi (Beẓah 29b). Heilprin, Seder ha-Dorot, ii. 343.